Top with granola or nugget type cereal for extra crunch. Extra canned pumpkin can be frozen. Stir all ingredients together in a bowl. Serve. 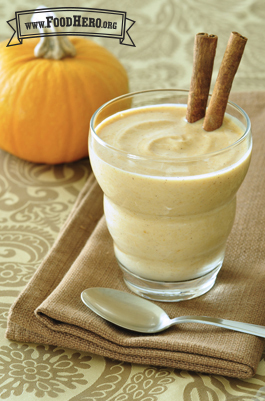 5 Comments for "Pumpkin Smoothie in a Cup"
This is my husbands all time favorite Food Hero recipe. It's so fast for me to make, and I don't even have to pull out the blender because I can mix it in a bowl. I mixed mine in a bowl with a spoon, worked great! We made this in a blender, and it was SO good -- everyone went back for seconds, and thirds! Freezing the pumpkin in ice cube trays and adding a little bit of milk works great to make this recipe in a blender, which makes for more of a drinkable smoothie. I also use half the amount of brown sugar suggested and use plain yogurt and half vanilla yogurt to reduce the sugar. Kids said, "It tastes just like Jamba Juice!"